Home » News » Is Drop Forging the Best Solution for Steel Parts Production? Q: I have a drawing design for steel metal parts, and it is used for automotive application. Now i am wondering which process i should choose to use. Is drop forging best solution for steel parts production? Drop forged parts had a 26% higher tensile strength than the cast parts. This means you can have stronger steel parts at a lower part weight. Drop forged parts have a 37% higher fatigue strength resulting in a factor of six longer fatigue life. This means that a forged steel part is going to last longer. 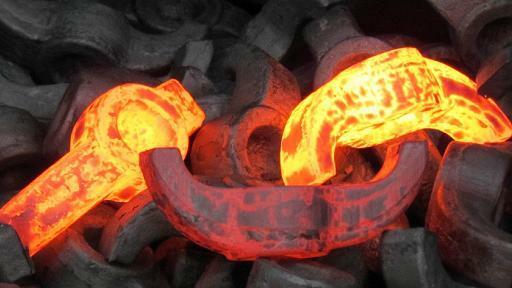 Cast iron only has 66% of the yield strength of forged steel. Yield strength is an indicator of what load a steel part will hold before starting to deform. The drop forged parts had a 58% reduction in area when pulled to failure. The cast parts only had a 6% reduction in area.That means there would be much greater deformation before failure in a forged part. Fortunately, all of our steel parts are drop forged, and they’re forged right here in China at our factory. Safer and made in China? I think that it will be a wise choice for you to do. Just take action and contact us for your drop forging needs. We will give you our best services with deep impression!